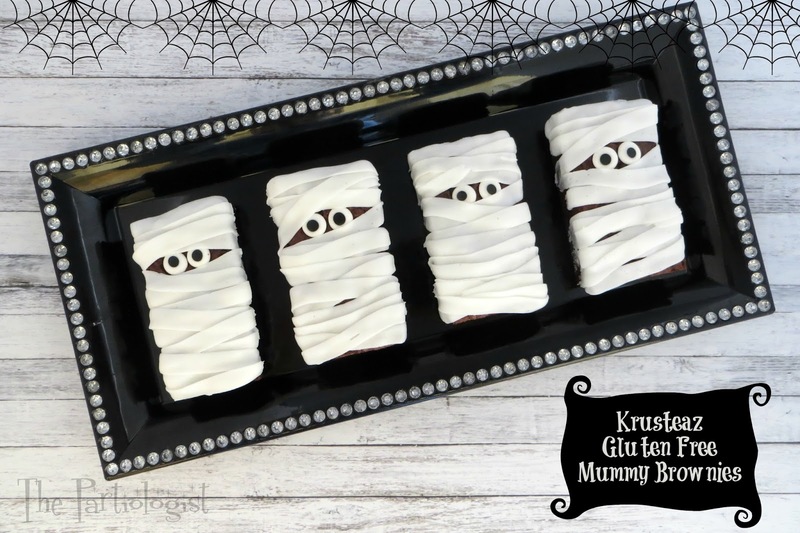 The Partiologist: Gluten Free Halloween Brownies! It's about time I feature a gluten free creation, don't you think? My daughter has been gluten free for a few years now and we have tried a few good and not so good recipes. Most of the time I read a gluten free recipe, I see a lot of stuff I don't recognize or have on hand, does this happen to you? Never Fear, Krusteaz Here! Recently I attended the IFBC (International Food Bloggers Conference - don't feel bad, I had to Google it) in Seattle. The first night of the conference, there was a gift suite, which was a room full of wonderful products for each attendee to take home. Yea, it was pretty sweet. As soon as I spotted the Krusteaz Gluten Free Brownie mix, it was added to my bag full of swag! Serious chocolate, like thick fudgy chocolate. Because these brownies were so good and deserved to be served in style, I decided to dress them up for Halloween. After the brownies have completely cooled, cut them into eight bars and remove from pan. The brownies alone, were so easy to make, I had plenty of time to decorate them like mummies. Add royal icing eyes to each bar. Fill a decorating bag with white buttercream frosting and a straight edge tip. 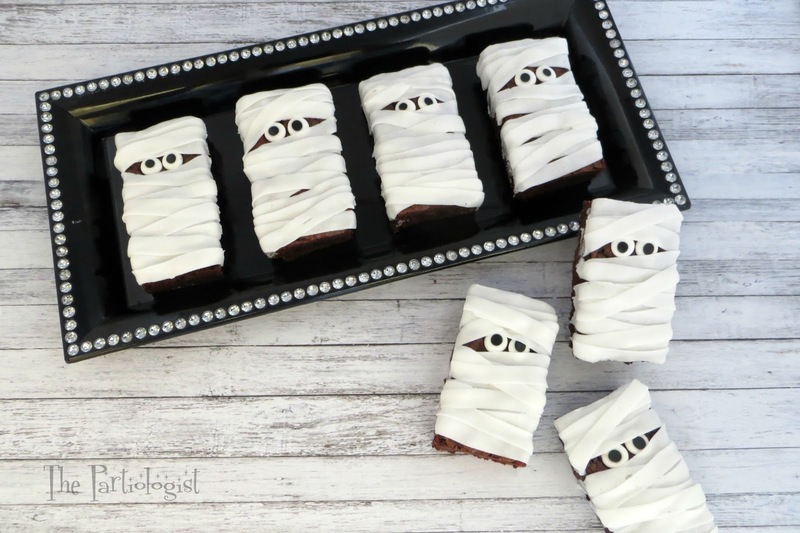 Pipe white frosting back and forth across the brownie until your brownie is mummified. Here's a list of other Krusteaz products - all of which I cannot wait to try, along with a little snippet about the company - don't you love it? Thank you Krusteaz for making my life a little easier, not mention yummier! Don't you think it's time to simplify your life and make some yummy mummies? Thank you Christine, I promise, these were some of the best brownies I've ever tasted! I can't wait until you give them a try, Grace will love them! Aww, thanks Sharon, I guess cute and easy can be in one sentence! My mummies and me thank you for pinning! Only you could take a bag of Krusteaz brownie mix and turn it into something so cute! Gluten free followers will LOVE this idea for Halloween!!! Love the mummies. There cute (as cute as mummies can be). And made with gluten free brownie mix sounds perfect for those that can't eat gluten.